A tower raises the attachment point for the towrope, improving the angle of pull to allow the rider easier launch off of the wake. Upward pull also makes deepwater starts easier for beginners. A tower provides the perfect mounting platform for tower audio speakers and lights. Universal towers collapse for easy garage storage. Convenient handhold when climbing into or out of boat. Towers dress up your boat and instantly improve its value. 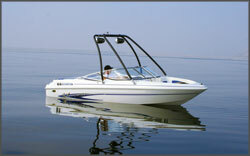 Universal or built to-fit options: Universal towers fit virtually any type of boat. Typically less expensive. Can be delivered immediately. Built to-fit towers fit exactly, can be ordered in a desired color, are often more expensive and can take 6-8 weeks for delivery in season. NOT available for all boats. Collapsible or fixed: Towers vary on how easily they collapse. All Skylon universal towers collapse flat with the windshield with no tools needed. A quality universal tower will be absolutely rigid. Many built to-fit towers don't collapse. Installation and fit: A quality universal tower is easy to install with complete instructions and factory support. Skylon universal towers will fit boats with beams between 78 and 110. Larger widths available by Special Order. Extends the height of the towrope attachment point to improve pull angle to rider, allowing huge air off the wake and easier deep water starts. A cost effective alternative to a tower. Fat Poles slip easily over factory installed, center-mount, tow pylons. Cable/ratchet system attaches quickly to the bow strap (provided). 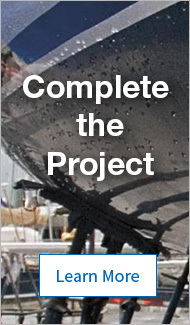 Skylon one-piece or two-piece PODs fit most outboard and I/O boats with no factory installed center-mount pylon. Easy installation/complete instructions included. Easily removed, with optional storage bag for all two-piece models. One-piece poles are typically less expensive, with no ski eye included. Two-piece models collapse quickly for storage and include ski eye.